Time was that I used to write, on Sundays usually, a Tech Talk over at The Oil Drum where I would try and explain some of the technical issues involved in oil recovery from the ground. Now that the site has effectively gone away, and I have had my couple of moments of frustration trying to explain why it isn’t because of the end of the Peak Oil story (here and here), the need for the occasional technical explanation still exists, and I still enjoy the chance to explain something. So as time permits and the need arises I will continue the practice. On this occasion the post is seeded by a note from Luis de Sousa (h/t Luis) who noted a story in Mother Jones. That story, in turn, fed from one in the Toronto Star and is about surface contamination of oil, coming from the underlying tar sands and emerging as a watery bitumen mixture over at least four areas in the Cold Lake region of Alberta. The story is difficult to report, since the contamination is centered within the Cold Lake Air Missile Range, where the Canadian military fires and tests live weapons. Unfortunately, as written, it seems to have some technical inconsistencies. The oil migration was apparently started by underground extraction wells that are being used to extract the oil from the oil sand, without having to dig it up first. There are two main ways of injecting steam through wells down into the oil sands that can produce the oil. 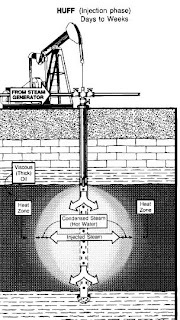 The one that is most commonly discussed is the Steam Assisted Gravity Drainage (SAGD) process, but the more commonly one used in the past is often known as “Huff and Puff.” I have described both of these in some detail in an earlier post. In this case the process would appear to be the older one, and as a refresher, here is what I wrote about it a couple of years ago. Surface mining of oil sand can only progress so far before the gradually deepening seams of the sand become too deep to continue to economically mine them. 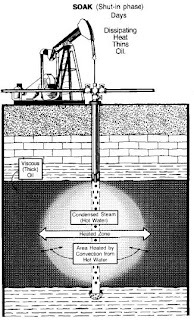 At the same time the viscosity of the oil is such that it does not flow easily to a conventional type of a well. This is not a new problem for the oil industry, which has had to address issues with the quality of the oil that it finds coming out of a well more than once over the past decades. One of the more easily applicable methods for improving the flow characteristics of the oil is through heating it. (And a quick caveat, the quantities of heat that I am talking about at the moment are significantly different from those that are needed in treating oil shale, and I will come to that topic in a couple or three weeks). The example of the effect that temperature makes on the ease with which a fluid flows that always first comes to my mind is of a visit to the Nurse’s cabin north of Montreal one winter, a long time ago, when after struggling through waist-high snow, we sat and poured whisky from a bottle left there, as we waited for the wood stove to heat the cabin. When we started the Scotch poured as though it was a heavy syrup. A typical oil found up in the oil sands of Alberta is much thicker, and more difficult to flow under normal operating conditions than that used in a car. For the areas of the province that are too deep for surface mining the temperature is not affected much by the changes in surface temperature, but the ground temperature is still low enough that the oil is very viscose, and production from a normal vertical well is usually too slow to justify the expense of putting in a well. So how can the viscocity be reduced? For a simple example, take an apple, which has fallen in the butter, and you want to clean it off. If you take the apple and put it under a cold stream of water the butter sticks to the apple, but if you raise the water temperature, suddenly the butter melts and runs off the apple. This happens best at about 185 degF, and if you were to turn a pressure washer onto a greasy surface you would find that it works better if the water is also heated above that temperature. (Some pressure washers are sold that way). Think now, if you will, of little Johnnie (helped of course by Jessica) having raided the orchard and spread butter onto all the apples, gluing them together and filling the kitchen full, right to the ceiling. How do we clean the butter off and get it back without taking all the apples out and cleaning them one by one (which is sort of what they do with the surface mined oil sand up in Canada). We could just stand in the hall and stick heaters up against the wall of apples, hoping that the heat would melt the butter and work its way back to the ones further into the kitchen. That sort of works, but burns the local apples and doesn't reach all that far. (They have tried setting fires inside oil wells, and we’ll get to that maybe next week). You could fill the kitchen with hot water, but while that washes out some of the butter, a lot of the heat goes into the apples and the water is cold before it reaches the back of the room. And the water doesn't have that much pressure to push the remaining butter off the apples. What we need is something that will get through the gaps between the apples and keep its heat. So how about steam? So you go and get a steam cleaner (such as you use for carpet cleaning) and blow the steam into the apples. That works but as the butter starts to flow out it clogs the gaps and starts to re-harden except when the steam is right there. So you start to run the steam for a bit, stop and collect the butter that comes out, run the steam for a bit, etc. You can do this in an oil well and it has the exciting technical name of "Huff and Puff" (would I kid you?). To make the steam more effective it is heated to between 150 and 300 deg C. Where the rock is very permeable and the steam can, in time, work its way back through the particles (apples) this can recover a lot of our butter. But you still lose a lot of heat, which is expensive to generate, just in heating the apples. Puff - The 3 stages of the process as illustrated by NETL. 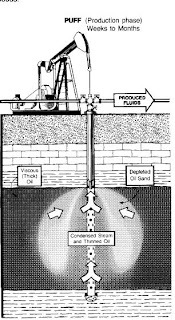 The problem is that this is still limited by the length of the borehole through the deposit, and because it is an intermittent process, it doesn’t give a continuous flow of oil. This spring bitumen emulsion was discovered on the surface and based on all the evidence gathered to date, we believe this rise to surface involves mechanical failures of wellbores in the vicinity of the impacted areas. A complete review is ongoing. The location of the latest leak under a body of water seems a little hard to support that conclusion – though I am not that familiar with the project history. What I do remember, however, from lectures that I have given on ground freezing when teaching ground control, was the great difficulty one can have in controlling the path of any fluid injected into the ground. I mentioned some of that in a post I wrote on permeability, some time ago. The gas used in the ground freezing is usually liquid nitrogen, and it is injected to freeze the ground around the injection point and along the path that the fluid takes. (In other words the reverse of that used in steam heating of the oil). But it has proved to be a very difficult process to control, because any small fissure in the ground can have a sufficiently lower permeability that the surrounding rock that all the fluid will flow to that channel. This is particularly a problem in the case of the oil sand, because if the steam finds an easy path to the surface (and the fact that this is the fourth instance suggests that the particular oil formation may be prone to such fissures) then as the steam migrates it heats and softens the bitumen so that it will flow with the steam, widening the channel and, over time, making the situation worse, if steam continues to be injected. Fortunately, with the “Huff and Puff” steam is only injected for a short while, before injection stops and the oil recovery phase begins. Yet, in the latest case, that was sufficient to bring over 4,000 bbl of bitumen to the surface. It seems likely that the process will need to be modified to give better control to the steam paths, and the oil migration. This can probably be achieved by switching to the SAGD process, which is planned in later work at the project. In the interim they might want to steer away from using the technique in regions where the oil grade is higher, and there is the potential for the sand to outcrop or come close to the surface without a confining cap rock.